1.1 Telangana history in between the centuries of 6-4 B.C. Telangana history in between the centuries of 6-4 B.C. 6th century B.C. has a significant place in the history of India because during that period, great changes like the founding of Jainism and Buddhism and the rapid expansion of Magadha empire and others occured. A new chapter btgan in the history of our nation in political and cultural arena. Two books– A Buddhist text called Angautharanikaya and a Jain text called ‘Bhagavati’ are most useful in detailing the political conditions of that period. These two nar­rated that – there were 16 Janapadas in the North India in 6th century B.C., and several Republics with people called Sakyas Kasaputtas, Bhagus and Moriyas flourished along with them. These books also documented the conditions of South India a lit­tle, along with the history of North India. The Department of Archaeology conducted a number a excavations recently and brought to light many ruins of ancient towns. This resulted in recon­structing the history of South India during that peri­od. One of the 16 Janapadas documented in Angautharanikaya was the Asmaka Janapada. This was spread in the Nizamabad district of todays Telangana and Nanded district of Maharashtra. It’s capital was Pothan or Pattiya. Recent excavations and Archaelogical studies brought to right many ancient towns at kondapur and Dhulikatta of Telangana and Amaravati, Vaddamanu and Veerapuram of Andhra Pradesh. Dr. P.V. Krishna Sastry stated that these were the 30 forts described Megasthenes. All these evidences reveal that there were many kingdoms in the Andhradesa (including today’s Telangana) by 6th century B.C. itself. Information to some extent was available about some of those kingdoms. They are- Mulaka, Asmaka, Kalinga, Bhattiprolu, Dharanikota, Andhaka and Andhra Kingdoms. The kingdom that flourished in Today’s Telangana region, very first was the Asmaka kingdom. The capital of this was Pothana or Pothan. It was a Non-aryan kingdom in the begin­ning as its name reveals. The name of it might have come from the devil Pothana who tried to kill Sri Krishna in his childhood. The Aryans might have taken it over from the descendants of Pothana. Jain religious texts say that this region was under the control of Rishabhanatha during the-Rigveda period, (the founder of Jainism); later on, his younger son Bahubali inherited it and ruled with Pothana or Pondanyapur (Today’s Bodhan, Nizamabad district) as his capital. Chamundaraya later stated that there was a 525 bows longs statue of Bahubali at Pothana and it inspired him to build the Gomatheswara statue at Poudanyapuram was mentioned in both Buddhist and Brahmanic literatures. Great Kannada poets – Pampa kumara and Vyasa also mentioned it in their writings. Poudanyapuram came from Pothana Puram. It transformed to Bodhan today. The Jain temple ruins found there reveal that it was an ancient famous Jain centre. Later On Ikshvaku Prince called Asmaka occupied the region and found­ed the kingdom called Asmaka after his name. Sudhasu was the 7th generation descendent >of Sagara’s offspring from Ikshvaku dynasty. His wife was Tilaka. She had problems when she was 7 months pregnant and their Guru Vasishta used a surgical instrument called Asmaka to take the infant out. That is why he got the name ‘Asmaka’. He was the founder of Asmaka state or kingdom. He was a contemporary of Parasurama. Parasurama attacked his kingdom, killed him and destructed it. The son of Asmaka was called as Mulaka. He fled to the west during the above attack and after some time founded a new state called Mulaka kingdom there after his name. Its capital was Pratishtanpur. These states were founded by the same dynasty. So, the Vishnupurana states that Asmaka and Mulaka kingdoms were founded by the Ikshvaku Princes. Ikshvaku dynasty ruled them until^ the period of Nanda rulers. These two were called as the Andhra kingdoms in Buddhist texts. A plaque found at Adome near Nagpur recently mentioned the Asmaka Janapada. It was written on the plaque that there was a Tree Chaitya there. The Buddhist literature said that a war would also happens between the Kalingas and Asmakas. Accordingly, Nandas invad­ed this kingdom. According to Puranas, Mahapadmananda rooted out the Kshatriya caste and was called as, Ugrasena and Parasurama-2. As the rulers of Asmaka and Mulaka kingdoms were Kshatriyas, Mahapadmananda invaded these two regions, rooted out the two dynasties and ceded them to the Nanda empire in 4th century B.C. When he invaded the two states, he camped with his army at nandadehara region. That is called as nanded today. After Nanda period, these two states became part of Maurya empire. They ruled these two regions with sopara as the capital for 200 years. After the decline of Mauryas, Satavahanas took over the twQ regions. Buddhist text Suthanipatha stated that a region called Andhakarattam was . located on the shores of river Godavari. According to scholars, this was the first settlement of Andhras in Andhra rash- tra. Katha Saritsagara narrates a story of a king called Deepakami. According to scholars Deepakami was the king of Andhra people. The story of Deepakami suggests that Andhras entered into Andhradesa through Maharashtra. His ancestors founded a kingdom there during the Buddhist era. That is why that region was called as Andhakarattam by the Suthanipatha. The histo­ry of Satavahanas also strengthens the fact that the region was the first settlement of Andhras. According to the story – Deepakami goes on hunting once, where a Yaksha named Sata (in the of a lion) gives Deepakami his infant son to lpokkqlter. That child of Sata was the first Satavahaim, His coins were found at Kondapur, Warangal, Kotilingala and Gajulabanda. That was their first settlement. Thus the story of Katha Saritsagaram states that the first Andhra kingdom was estab­lished in that region, which was called as Andhakarattam; Satavahanas belonged to that state; that is why Puranas found them (Satavahanas) as Andhras. So, it can be concluded that the region called Andhakarattam was there even before the advent of Nandas and that is the Andhrarajya (today’s Telangana). People called the Sahara race lived in the region between the Andhakarattam and Kalinga kingdom. They had a separate state even from the period of Ramayana. They continued living at the river Valley region of Sabari (in the North Andhra region of today) during 6th century B.C. This region is also considered as a kingdom in the Andhradesa but it was called as ‘Sebaka state / kingdom’. Scholars say that Peddabankur and Dhulikatta were a part of this kingdom and that their capital was Dhulikatta. An ancient fort and many mins were found in the excavations conducted at Dhulikatta. Coins with let­ters – ‘Raja seelakasa’ in Brahmi script (of 3rd cen­tury B.C.) were also found there. The meaning of that was the coins were issued by king Silakasa. He was considered as a Sebaka king belonging to the Sahara race. A number of other coins were also found in the region. So it can be concluded that Sebaka State was one of the ancient kingdoms of Andhradesa. This was also conquered by Satavahanas. At the South of Sebaka kingdom was located a region called the Mahishamandala. This kingdom was mentioned in both Itihasas and Puranas. The Arthasastra of Kautilya says that , Mahishamandala was famous for textile industry.Simhala text ‘Mahavamsam’ also mentioned Mahishmati kingdom. Historians thought that this state was located at today’s Nalgonda and Mahabubnagar districts region. This was a famous ; kingdom by 4th century B.C. itself. The Northern region of Andhradesa is being called as the Kalinga kingdom from very ancient I times. This was a famous Non-Aryan kingdom since the ancient Ages. The jain text Bhagavati, which mentioned 16 Maha janapadas of North India by 6t century B.C. stated the Kalinga as a Non-Aryan kingdom. So there was no doubt that it was in exis- tence by that time megasthenes in his book ’Indica’wrote that it was the greatest kingdom of So’uth Indian region. And also that it owned 6 lakh army, 7000 elephants and a thousand horses. As it was such a strong nation, it could fight the mighty army of Ashoka. So it can be concluded that Kalinga was also a kingdom in the Andhra region of that period. Nisambha. Bike wise belonged to another tribe and he came though Maharashtra into Andhradesa and founded his kingdom in Telangana region. Stories of that period suggest that Andhras mixed with the local races, like Nagas and yakshas who were ruling the regions before their advent. All the stories of that period suggest that these races mingled and married each Other to create a new breed. Sata, the father of Satavahana was a Yaksha and Satavahana s mother was the daughter of a sage (muni). He sees her while she was bathing and marries her secretly (Gandharva marriage). But her father, who was an Aryan sage curses them and turns them into lions. Satavahana was their son. His coins were found in kondapur and other places. Satavahana dynasty were his descendants. The story of Gunadhya also indicates inter-racial mar­riage: Gunadhya’s mother was a Brhamin woman, meaning that she was an Aryan. Vasuki was the king of Nagas. He loves her and marries her secret­ly. But unlike the case of Sata, their marriage was accepted, which means that by then Aryan – Non- Aryan marriages came to be accepted. All these sto­ries indicate the intermingling of local Non-Aryan races like Yaksha, Naga and Dravidian with the Aryans in Andhradesa.It can be said that – Andhradesa was divided into many small kingdoms between 6-4 centuries B.C. Their population was in lakhs. The Magadha emperors invaded that Andhradesa in the 4th centu­ry B.C. First Nandas and then Mauryas conquered the Andhradesa (including Telangana) and annexed it to their empire. It continued as a part of Mauryan empire for 200 year from 4th century B.C. That is why it can concluded that the Historic Age began in Andhradesa from 4th century B.C. as Megasthenes mentioned Andhras in his writings and Ashoka issued stone inscriptions. Those inscriptions were the very early basis of the history of Telugu people because he mentioned Andhras in his inscriptions. The Magadha empire played significant role in the politics of North India from as early as the 6th century B.C. A great empire was established by 4th century B.C., under the leadership of Nandas. Puranas says that Mahapadmananda rooted out all the Kshatriya kingdoms and ruled North India with absolute authority. But he was not satisfied and came towards the South and conquered the Kalinga, Asmaka, Andhra and Kuntala kingdoms. The Hatigumpha inscription of Kharavela reveals that the Nanda king dug a canal in Kalinga and took a statue of Jina from Kalinga to his kingdom. This proves that the Nanda kings conquered and ruled the Kalinga also. So it can be said that the North Andhra region, which was a part of Kalinga also came under the rule of Nandas. Puranas say that the Nanda king also conquered the Kshatriya king­dom, in the Asmaka region (on the banks of Godavari). This was the Bodhan region of Nizamabad district. He then conquered Mulaka kingdom and camped at Nandadehara, which is being called as “Nanded” now. The Kannada inscriptions of 10th and 11th centuries A.D., reveal that Mahapadmananda conquered the Kuntala kingdom also and ruled it. One of the 11th century inscriptions says that Nanda era was under imple­mentation in South India. Chandragupta Maurya defeated Nandas and ascended the throne of Magadha empire in 322 B.C. and founded the great Mauryan empire. But during the Nanda-Maurya conflict, the South became inde­pendent. Kalingas were said to be a very strong and independence loving people. They did not like to be under the control of the magadha empire and must declared independence. The other states followed them. That led Chandragupta to declare was again on the Dakshinapatha (South) and this time he brought the region upto Karnataka under his con­trol. Jain texts say that Chandragupta Maurya joined Jain religion during his last days; went to the Sravanabelagola with his Jain teacher Bhadrabaha; practiced the Sallekhana Vrata and died there. The inscriptions of 6, 7, 10, 12 centuries A.D., found in and around Sravanabelagola strengthen this infor­mation. Harisena, in his Brihatkathakosa of 10th century A.D. wrote about the Sallekhana Vrata of Chandragupta. There was a Chandragupta cave in Sravanabelagola.Kautilya, said to be the contemporary of mau- rya Chandragupta narrated the routes to go to Dakshinapatha and the types of trades there in his writings. Megasthenes, who stayed in the court Vijeta Competitions of Chandragupta for some time, wrote about the army and forts of Andhra* in detail in his book “INDIKA”. He wrote that a. queen called Pandeya was ruling the Pandya kingdom; there were 365 villages in that state; Every day a village paid taxes to her; and Pandya kingdom owned an army of 1,30,000 foot men, 50 elephants and 4000 horses. All these writings indicate that Chandragupta Maurya became the king of Southern region and controlled the kingdoms in it, but there were no definitive sources to know the conditions of Andhradesa during that period. . Ashoka was a great king not only among the Indian rulers but also in the world. He came to rule in 274 B.C. He was very empirical. Kalinga desa was not conquered by his grandfather Chandragupta Maurya and was left as an independent state in the middle of his Maurya empire. Northern Andhra was a part of Kalinga desa during that period. Empirical minded Ashoka could not bear the idea of an inde­pendent Kalinga state and he invaded it. But Kalingas, famous for their valor and strength were also lovers of freedom, and they did not yield to the mighty Ashoka but bought the battle heroically. One lakh people died and one and half lakh people imprisoned, according to the stone inscription of Ashoka. This proves that the writings of Megasthenes were correct. He wrote that. Kalingas had the strength to do battle with the 6 lakh strong Magadha army. But the name of the king and leader of Kalingas who led the war courageously against the Magadha army has not been mentioned any where in his inscriptions by Ashoka. May be he did not like to mention the name of his great enemy. However, this whole episode proves that the Kalinga kingdom was^the greatest of all the South India kingdoms of that period. With this war, Dakshinapatha, Karnataka was annexed to the empire of Ashoka. Though the conditions and names of kings Andhradesa (including Telangana) of the period of Ashoka were not known, evidences of the extent of Buddhism were found in some places. Stone inscriptions of Ashoka were found at Erragudi of Kumool district and also at Rajula Mandagiri. Some were recently followed at Amaravati and kottam of East Godavari district. Ashoka must have visited this region- during the construction of Stupas or writing of inscriptions. Ashoka issued inscriptions all over India. They helped us in reconstructing the history and in col­lecting details of the rulers of Andhradesa. Vasti, the grandfather of Kharavela at Kalinga, Deepakami, who brought up Satavahana at Andhrarattam and Savera, father of Kuberaka at Amaravati were rul­ing the Andhradesa (including Telangana) as subor­dinate kings of Ashoka during that period. Also, Gobhadra and Samagopa in Karimnagar must have been the subordinate rulers under Ashoka, accord­ing to these sources. Though Ashoka issued hundred of inscriptions, it was unfortunate that he did not mention a single Andhradesa ruler by name in any of them. Ashoka died in 232 B.C. and the South declared independence from the Magadha empire. The Southern kingdoms declared independence after Ashoka’s death in 232 B.C. historians conclud­ed until recently that – immediately afterwards Satavahanas, the subordinate kings of Mauryas brought the Andhra desa under their control and ruled. But it was not so, according to new research and evidence that were found recently. Archaeological studies have been conducted in Kondapur of Medak district, Dhulikatta of Karimnagar district, Nelakondapally of Khammam district, Rangapur, Gummakonda and Kudali Sangameswaramm of Mahabubnagar district, also Alampuram, river basins and the places between the rivers Krishna and Tungabhadra like Kolhapur and Chandravelli. These studies revealed that other dynasties ruled this region before Satavahanas and after the fall of Mauryan empire. The State Archaeological and Museum depart­ment conducted studies at Kotilingala of Karimnagar district between 1980-83. New evi­dences regarding the history of Telangana were revealed. Excavations there brought to light hun­dreds of coins in 6 layers. These coins revealed the names of 13 kings; 8 of them ruled before the Satavahana period and 5 of them were Satavahana kings; which proves that other kings ruled there before the Satavahana dynasty and in the declining period of Mauryan empire. These coins brought to light the history of that particular period in Telangana. 15 varieties of coins were found there. The studies in dhulikatta revealed the name of another king called ‘Salakasa’; the studies at Palakonda of Warangal district revealed the name of a ruler – “Maha Talavara Sivakhada’; the studies at Nelakondapally revealed the name of ‘Maharathis SivakanasaV The research in these three places focussed the history of Telangana in new light. These studies also revealed the contemporary history before the Satavahana era and helped to reconstruct the happenings of that period in Telangana. While the Satavahanas were ruling in the Maharashtra region, with Pratishtanapura as their capital, different kingdoms were ruling differ­ent regions of Telangana. They also declared inde­pendence after the fall of Mauryan empire along with the Satavahanas, Kalingas, Mahameghas and other dynasties. The names of kings revealed in these studies are given below. Maharathi dynasty When studies were conducted on the rulers of Nelakondapally, Khammam district, and some regions of Karnataka, the name of a dynasty called ‘Maharathi’ was revealed. Ashoka’s stone inscrip­tions called them as ‘Rathikas’. Historians opined that they were kings of subordinate kingdoms at dif­ferent regions during the Mauryan rule. They declared independence after the fall of Mauryan empire in Andhra and Karnataka regions. They ruled some regions of Andhra and Karnataka until 100-150 A.D.
During excavations in the area between rivers Krishna and Tungabhadra, coins of kings named ‘Maharathi Maha hastin’, ‘Maharathi Siva Mahahastin’ and ‘Maharathi Khadga Padihastin’ were found. These coins contain a pic­ture of elephant on them, some say that they belong to Maharathi dynasty and others say that they belong to Hastina dynasty. A coin, with the name Mahatalavara-sivakha- da, which was found in Palakonda of Warangal dis­trict informs that there was dynasty called called Talavara’. Subordinate kings and army chiefs with the name Talavara, worked under Ikshvaku rulers who ruled after the Satavahanas. Before the coins, with the name Talavara on them were found, it was thought that Talavara was a designation as it appeared in the inscriptions of Ikshvakus. But the coins found in Palakonda revealed that it was the name of dynasty. Satavahanas did not rule the Andhradesa. Three fourth of Andhradesa was not under their control, only the North Telangana was controlled by them. Their kingdom had extended more into to Maharashtra, Vidarbha and West Karnataka regions. This situation continued until the period of Gautamiputra Satakami. Gautamiputra Satakami attacked and conquered these kingdoms. Then, his son Pulomavi had became the ruler of Andhra region, and made Dhanyakataka his capital. The coins of Satavahanas were found in Andhradesa only after the period of Pulomavi. So historians conclude that – until then Telangana was independent and from the period of Pulomavi, coastal region and Rayalaseema were annexed to the Satavahana kingdom. Another thing revealed by these studies was – The names of kings like Gobhadra and Samagopa, found in Telangana belonged to the Vaishnava faith. This indicated that Vaishnavism was in practice by then in Telangana. The name of the second ruler of Satavahanas was Krishna. This name also belongs to the Vasudeva faith. Thus, these studies helped to find the political and reli­gious conditions of Ancient Telangana. Satavahanas, whether they are related to them or not is not known. But the discovery of their coins indi­cates that they had their kingdom in the Karimnagar district region. As a coin with the name ‘Satavahana’ was found in Kondapur, their kingdom must have been located in Nizamabad and Medak region. As a coin with the name ‘Simukha’ was found along with the coins of gobhadra and Samagopa, it is concluded that Simukha conquered their kingdom. That is why the upper layers at Kotilingala revealed the coins of Satavahanas. Though Satavahanas conquered the above kingdom, they left the kingdom of Maharathi dynasty at Nalgonda and Mahabubnagar districts region alone. It is said that Simukha married a woman of Maharathi dynasty; and also his daugh­ter-in-law was a Maharathi princess. That might be the reason for him to not to conquer their kingdom. Simukha turned left to his kingdom, conquered the Asmaka and Mulaka kingdoms and made Pratishtanapura his kingdom. That is why, though the rule of Satavahanas began in Nizamabad region, it did not expand into today’s coastal Andhra and Rayalaseema, but expanded towards Maharashtra and Vidarbha and later on to South Karnataka. Satavahana kingdom did not expand towards Andhradesa until the period of Gautamiputra Satakarni, as stated above. ^The Maharathis dynasty was ruling in the Khammam, Nalgonda and Mahabubnagar districts until then. As the Satavahana dynasty rule strengthened in the Western Deccan, the Maha megha vahana dynasty which declared independence in the Kalinga region conquered the East Coast. Kharavela of that dynasty was very famous as a courageous king. He conquered the East Coast upto Pandya kingdom. His descen­dants and later rulers of Sada dynasty ruled the Kalinga and Coastal area. In this background Gautamiputra Satakarni invaded the South Telangana, defeated the Sada dynasty and annexed the Andhra and Kalinga regions to the Satavahana empire. With that, the entire Andhradesa (today’s coastal Andhra, Rayalaseema and Telangana regions) became a part of the Satavahana empire. The Satavahana era began with that. 2.The name of the kingdom that was spread in the Nizamabad district region of Telangana and Nanded region of Maharashtra, which was one of the 16 Janapadas. 3.Capital of Asmaka kingdom, which was stated as of the 16 Janapadas. 5.Where was a plaque in which the name of Asmaka Janapada was mentioned, found recent­ly? 6.Name the Andhra king, whose story was narrat­ed in the Kathasaritsagara. 7.Which Buddhist text’ stated that a kingdom called Andhakarattam was located on the banks of river Godavari? 9.Pedda Bankur and Dhulikatta of Karimnagar district were considered to be a part of this kingdom in 6th cen­tury B.C. what is the kingdom? 11.This kingdom was mentioned in Itihasas and Puranas as well as in the ‘Arthasastra’ of Kautilya as famous for textile industry. Which place is that? 12.Which Telangana regions came under the Mahishmati kingdom of 4th century B.C. accord- ■ ing to historians? 14.Which Jain text stated the Kalinga kingdom of 6th century B.C. as a non-Aryan kingdom? 15.Name the Nanda dynasty king mentioned in Puranas as the destroyer of all Kshatriya kingdoms and ruler of . India in 4th century B.C.? 17.When did the A.P. state Archaeological and muse­um department conduct excavations and studies at Kotilingala of Karimnagar district? 18.Give the names of the king who ruled before Satavahanas, as told by the Archaeological experts who conducted excavations at Dhulikajtta, palakonda and Nelakondapally of Telangana region. 19.Which subordinate kingdom ruled the Nelakondapally region of Telangana during the Mauryan period, according to historians? 20.The presence of whicS dynasty was revealed in Telangana, when a coin with the name ‘Mahatalavara Sivakhada’ was found at Palakonda of Warangal district? 1.Which Janapada was mentioned on the ancient plaque, found recently at Adome region near Nagpur? 2.The names of kings who ruled in Telangan before the Satavahana era were found recently at a place in Archaeological exca­vations. Which place is that? 3.Which dynasty ruled in the Telangana region along with the early Satavahanas? 4.Excavations conducted between 1980-83 AD. revealed hundreds of coins of Satavahanas and of the rulers before them. At which place of Telangana were the studies done? 5.Which famous ancient Simhala book stat­ed the details of Mahishmati kingdom? 6.Who among the following was a king ruled prior to Satavahana era as revealed by the excavations conducted in Telangana? 7.Which among the following Was an ancient ruler of Andhradesa mentioned in the Kathasaritsagara? 8.Which texts stated that Bahubali, son of Rishabhanatha ruled Telangana region with Pothana or Poudanyapur as his capital? 9.Which among the following narrations states that in the ancient Andhradesa, Andhras min­gled with the local races like Nagas, Yakshas and Dravidians sexually to procreate. 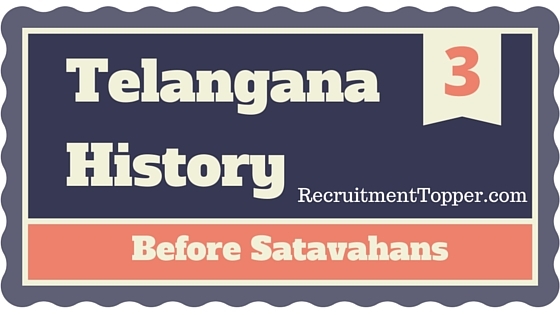 10.Which among the following dynasties ruled Telangana prior to Satavahanas, as opined by historians? 11.Which among the following names is con­sidered to be the name of the king who ruled prior to Satavahanas, as found on the coins discovered at Kotilingala of Karimnagar district? 12.New information about the kings who ruled Telangana region after the decline of Mauryan empire was found during the exca­vations conducted at place in Mahabubnagar district. Which place is that?